I recently read an article that quoted Manny Pacquiao’s trainer, Freddie Roach, claiming that if the eagerly-awaited Mayweather-Pacquiao super-fight does happen, it could be as a career finale for both men. During the Pacquiao-Bradley II post-fight interview with Larry Merchant of HBO Boxing, Manny stated that he thought he had two years left as a professional boxer, which means his career would come to a close around May 2016. 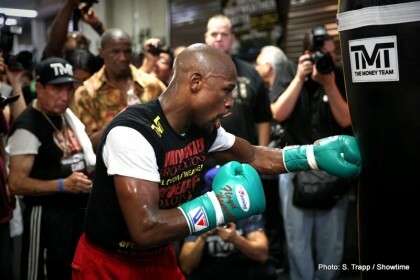 Intriguingly, Mayweather has three more contests remaining on his contract with Showtime beyond the Maidana bout. Assuming that Floyd remains undefeated and fights every May & September each year, his final bout under the Showtime banner would be September 2015… and a victory on that date would equal Rocky Marciano’s 49-0 professional record. I’ve also been reading rumours about the likelihood of Manny Pacquiao signing a one year contract extension with Bob Arum’s Top Rank promotional company towards the end of the year, which would mean that the super-fight couldn’t be made until 2016 at the earliest as both men would be contractually tied to rival promotions/networks until the end of 2015. Therefore, assuming that Floyd doesn’t encounter any injuries or issues that postpone his remaining fights… and Manny’s new (rumoured) Top Rank contract expires at the end of 2015… then in theory, Floyd would be attempting to surpass Rocky Marciano’s undefeated record (to become 50-0) when both he and Pacquiao have the final fights of their career when they finally face each other on Cinco de Mayo weekend in 2016. Whilst it’s fair to say that Floyd and Manny are past their respective primes, they’re both still good enough to beat the current crop of welterweights. As long as their careers are carefully-managed, they should be able to avoid defeat until we finally get the chance to witness their super-fight on Cinco de Mayo weekend in 2016. Floyd Mayweather Jr’s remaining contests of his Showtime contract could be against the likes of: Marcos Maidana; Amir Khan; Danny Garcia; and a lucrative rematch against Saul ‘Canelo’ Alvarez. Manny Pacquiao could end up having a fifth bout against Juan Manuel Marquez around November this year and perhaps face two other high-profile Top Rank fighters in 2015 like Ruslan Provodnikov and Mikey Garcia. Assuming that Mayweather and Pacquiao can safely negotiate their way through these fights, then this paves the way for the eagerly-awaited Floyd Mayweather Jr. vs. Manny Pacquiao on May 7th, 2016. Imagine the guaranteed purses Floyd and Manny would receive if they joined forces as free agents and sold the rights of this super-fight to the highest bidding promoter and network? Of course, there may be an upset along the way to scupper one or two of these predicted bouts, but I’m still confident that my prophecy will closely resemble reality. I know that what I’ve written sounds a bit far-fetched, but if you review the stats, facts and a few quotes from various parties, all the evidence conveniently points to a Mayweather vs. Pacquiao super-fight on May 7th, 2016, which would be the career finale for both men. Previous boxing news: A retrospect of the 4th fight between Manny Pacquiao and Juan Manuel Marquez – would five times be too much? You are here: Home / Boxing News / Mayweather Jr. to fight Pacquiao on May 7th, 2016?